No prep. No work. No worries. All delicious. Omaha Steaks Crock-Pot Meals deliver the easy any-night dinner solution you've been searching for, and with our Crock-Pot Meals Collection, you can keep them at the ready. 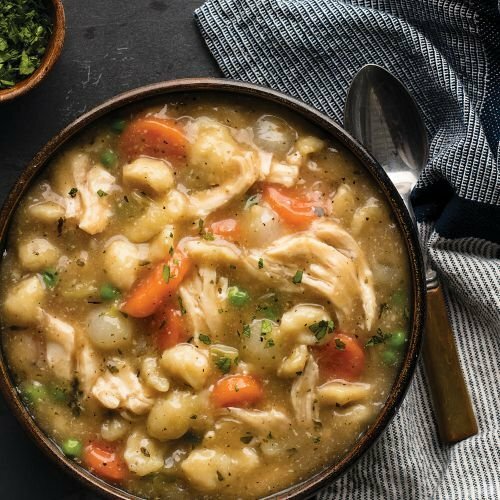 This combo includes four no-prep freezer-to-slow cooker meals: Homestyle Chicken and Dumplings, perfectly spiced White Chicken Chili, hearty Rustic Italian Beef Stew, and family-favorite Beef Bourguignon. PLUS, lock in the very best price on this family-friendly collection with Autoship & Save, our NEW no-hassle automatic delivery option. Set up Autoship to have this amazing combo delivered as frequently as you'd like - you'll even save 5% on every subsequent shipment. BONUS: Includes our Cuban Mojo Pork Crock-Pot meal for FREE! INGREDIENTS: SAUCE (WATER, ONIONS, CHICKEN BASE [CHICKEN MEAT WITH NATURAL JUICES, SALT, ORGANIC CANE SUGAR, MALTODEXTRIN, YEAST EXTRACT, CHICKEN FAT, ONION POWDER, TURMERIC, NATURAL FLAVOR, SPICE EXTRACTIVE], CORN STARCH, HEAVY CREAM [GRADE A CREAM, CARRAGEENAN], CELERY, GARLIC, BUTTER [CREAM, SALT], SPICES, SHERRY COOKING WINE [SHERRY WINE, SALT, SULFITES], WHEAT FLOUR, TOMATO PASTE, SEA SALT), BISCUIT DUMPLINGS (WATER, BLEACHED ENRICHED WHEAT FLOUR [WHEAT FLOUR, MALTED BARLEY FLOUR, NIACIN, FERROUS SULFATE, THIAMINE MONONITRATE, RIBOFLAVIN, FOLIC ACID], EGGS, SOYBEAN OIL, EGG WHITES, SALT, MONOGLYCERIDES, BAKING POWDER [SODIUM ACID PYROPHOSPHATE, SODIUM BICARBONATE, CORN STARCH, MONOCALCIUM PHOSPHATE], DOUGH CONDITIONER [SODIUM STEAROYL LACTYLATE, CALCIUM SULFATE, SODIUM SULFITE], SPICES, NATURAL FLAVOR, OLEORESIN TURMERIC), CARROTS, PEAS, PEARL ONIONS. INGREDIENTS: CHICKEN BREAST: UNCOOKED CHICKEN BREAST MEAT WITH RIB MEAT.